Minimoons (temporarily captured objects, TCOs) are gravitationally bound to the Earth-Moon system while quasi-satellites (section 4) are not. (Top) Trajectory of the minimoon 2006 RH120 during its capture in the Earth-Moon system in 2006–2007. The Earth is represented by the yellow dot located at the origin of the J2000.0 mean equator and equinox reference system. 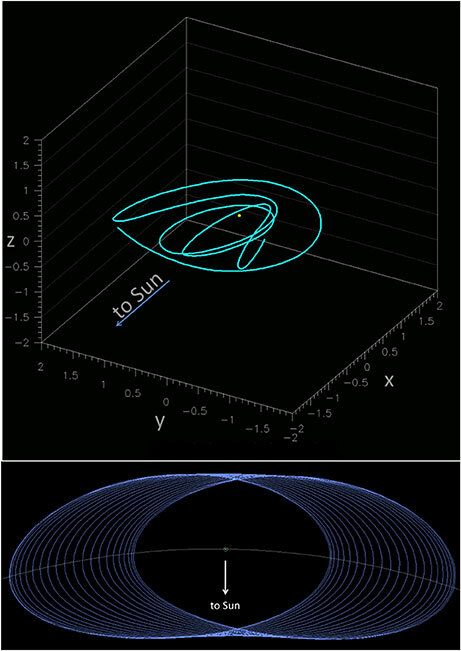 (Bottom) Trajectory of Earth’s quasi-satellite 2016 HO3 shown in blue as projected onto the heliocentric ecliptic x − y plane in the synodic frame. Earth is represented by the green dot in the center and the Moon’s orbit is represented by the small white circle. Earth’s orbit is shown as as the white arc from left to right and the direction to the Sun is to the bottom [credit: Paul Chodas (NASA/JPL); Chodas, 2016]. The detection of “minimoons” — small asteroids temporarily captured in orbit around Earth — will vastly improve our scientific understanding of asteroids and the Earth-Moon system, says a new review published in Frontiers in Astronomy and Space Science. These small and fast-moving visitors have so-far evaded detection by existing technology, with only one confirmed mini-moon discovery to date. The advent of the Large Synoptic Survey Telescope (LSST) will verify their existence and track their paths around our planet, presenting exciting scientific and commercial opportunities. Be the first to comment on "Earth’s Minimoons Provide Exciting Opportunities for Science and Technology"